Meet the lovely women of Kazan on this virgin Romance Tour! In addition to Kazan's other attractions, this city holds some of Russia's most beautiful women! The population of Kazan, well over 1 million, is so diverse you will find some of the women to be an irresistible blend of Slavic, Asian and Eastern features while others retain their pure Slavic influences. Shiny black hair and dark eyes - or Scandinavian blonde with green eyes, and exquisite, feminine figures are complimented by a natural charm, warmth and affection so typical of Eastern European and Asian women! Our Kazan Romance Tour package features a 4-star hotel and 3 large Champagne Socials with hundreds of sincere and gorgeous women in attendance. We'll whet your appetite by spending our first 3 days and one Social in Moscow, Russia's modern, metropolitan capital. Then we'll take you back in time to a truly romantic city - Kazan - where the women dream of meeting a loving, gentle and family-oriented foreign man! You'll be the center of attention as we introduce you to the most charming and unbelievably lovely ladies you've ever met! Join us for our first, unforgettable Romance Tour to Kazan! 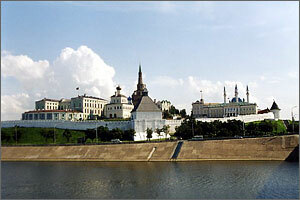 Nestled in Russia's interior, on the right bank of Europe's largest river, the Volga, is the historic city of Kazan. This 10 century-old intersection of eastern and western cultures boasts some of Russia's oldest architectural masterpieces. A tour of Kazan's Old City will take you back to a medieval time as you walk in the white silhouette of the Kremlin Wall, or view the legendary Sujumbike Tower. 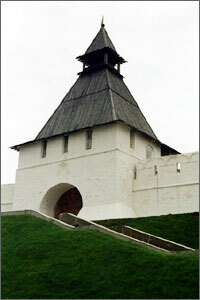 Legend has it that in the 16th century Ivan the Terrible built the tower for Kazan's Queen Sujumbike, in hopes of impressing her into marriage, yet she climbed to the top and leapt to her death in defiance. Kazan is a city full of legends like this, immortalized by Russia's most treasured writers, Leo Tolstoy and Alexander Pushkin, who both lived and wrote here. Kazan is a city of terrific culture, boasting 16 professional theaters, 27 museums, a State Symphonic Orchestra, and annual festivals like the International Opera Festival or the festival of Classic Ballet. Yet Kazan's nightlife offers a variety of nightclubs, sports bars and restaurants! When you and your lovely Russian lady have had your fill of the nightlife, you can end the evening with a romantic walk along the Volga's riverbank. Discover why more Romance Tour clients place their trust in Russia Singles each and every year than any other tour agency! Be a part of Russia Singles's only live telephone discussion group as our panel answers your questions concerning Foreign brides, immigration issues, cultural differences and Foreign marriage services/Singles Tours. Our panel often includes Ms. Jones, Immigration Attorney and Vice Chairperson of the Immigration section of the State Bar of Arizona, John Adams, President of Russia Singles, Bud Patterson, leading expert and author of Foreign Bride 101, past Romance Tour clients and real Foreign ladies who have married foreign men. You will be joined by up to 100 callers from around the world for an hour or more of informative, current, and important information for anyone considering meeting and marrying a foreign bride. It's free, informative, and fun, so mark it on your calendar and be sure to call in and join the conversation!